The job of the investment advisor, in part, is to filter all the daily financial noise down to the most salient, most valuable data. After all, we are entrusted by our clients to invest with the future in mind, not the past. This is easier said than done. We are bombarded with economic statistics every day. Most are isolated tidbits which require context to give them meaning. Many have no predictive value whatsoever, but are ascribed so by the commentators. The “noise” is almost deafening, you might as well just mute the TV! One statistic given some attention each month by financial pundits comes from The University of Michigan’s Consumer Survey Center. They question 500 households each month regarding their financial condition and attitudes about the economy, and use the answers to compile a series of indexes. Their Expectations Index that we're looking at today represents a small segment of the entire survey. The first graph illustrates the Expectations Index since 1996. Each line represents a different age group (as noted in the legend). The vertical lines represent the starting and ending points of the last two recessions (Source: NBER). 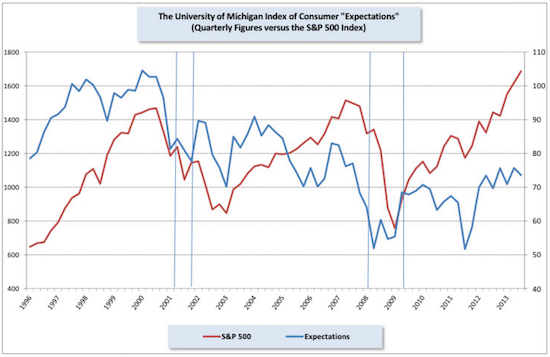 Do declines in consumer expectations line up with future economic downturns? Certain time periods in this chart seem to imply correlation while others don’t. We can see a big difference between the two lines in the mid-1990’s and today. In fact, the spread now between how we feel about our future prosperity and stock market results is greater than at any time in the last twenty years (and probably much longer, but the data set is limited).